Wearing contact lenses can lead to keratoconjunctivitis sicca, or chronically dry eyes. Keratoconjunctivitis sicca is more commonly known as dry eyes. Keratoconjunctivitis sicca is more commonly known as dry eyes. It may also be referred to as dry eye syndrome, keratitis sicca, sicca syndrome, or xerophthalmia, and is caused by either inadequate tear production, or tears that evaporate too quickly. It is usually a chronic condition, and has many possible causes, including certain diseases and medications, aging, eyelid disorders, chemical or thermal burns, contact lens use, and vitamin A deficiency. Keratoconjunctivitis sicca is relatively common, especially among people over 40. It can also affect cats, dogs, and horses. 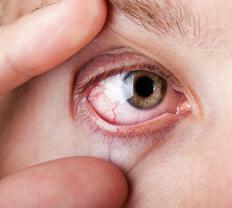 Symptoms of keratoconjunctivitis sicca include dryness, itching, burning, redness, and general irritation in the eyes. Some patients experience a sensation of foreign matter or pressure in the eye and a sensitivity to light. The eyes may have a stringy discharge and excessive tearing that does not provide relief. A dry, windy, dusty, or smoky environment can exacerbate the condition, as can overuse of the eyes as in prolonged reading, television watching, or computer use. For most people, keratoconjunctivitis sicca is uncomfortable, but not serious. However, in severe cases, it can lead to loss of vision. The constant dryness of the eyes can cause tiny abrasions to form on the surface, which can lead to scarring, corneal thickening or erosion, and other serious damage to the cornea. If caused by disease or medication, keratoconjunctivitis sicca can be treated by addressing the cause. Moisturizing eye drops or ointments can help alleviate symptoms and prevent complications. Avoiding dry, smoky, or dusty environments, or using a humidifier are helpful in managing the condition. Keeping the eyelids clean and making sure to rest the eyes at regular intervals are also advised. 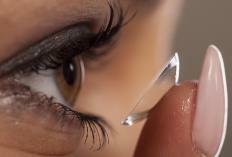 Patients who wear contact lenses may find relief by switching to glasses. Medication and dietary supplements may be used to treat keratoconjunctivitis sicca. Topical steroids or immunosuppressants like ciclosporin can help prevent inflammation. Omega-3 fatty acids, found in dark-fleshed fish and over-the-counter supplements, can also relieve symptoms. The fish oil in the supplements can also be applied topically to irritated eyes. Some treatments for more serious forms of keratoconjunctivitis sicca are aimed at conserving tears. The punta, tiny openings in the eyes that drain tears, may be fully or partially closed through the use of punctal plugs or cauterization. There are also specialized contact lenses that create a fluid layer over the eye to maintain hydration. In the most extreme cases, tarsorrhaphy, a surgical procedure in which the eyelids are completely or partially sewn shut, may be required. What Is the Treatment for Cat Eye Syndrome? How do I Choose the Best Contact Lenses for Dry Eyes?